A few weeks ago I got a magazine called "Wish Craft" from the Chasing Fireflies company. They have some super cute clothes and now some even cuter costumes. We have yet to decide on a costume though I've picked out 3 that I like. So tell me, what one is your favorite? 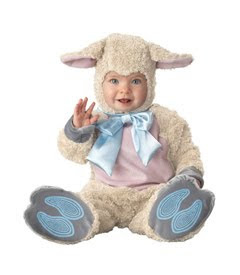 My little lambie...I thought this was adorable. He's God's little lamb, it's in blue so it's boyish and this is probably the only Halloween I can get away with dressing him in this. Yes, I know you're shocked to see a monkey costume. But I think B would love it. And if Chris would permit my inner geek to come out, I'd be all over this Yoda costume. Oh my...you Have to chose the monkey...That is just too stinkin cute. I love, love, love the monkey!!! I like the lamb. Like you said, this is the only year you can get away with it. I was sick and didn't do "I don't" either yesterday. I laughed so hard when I realized that you didn't do it! I love the yoda - I almost got Princess Leia for Harper. We originally wanted Harper to be a monkey but we fell in love with the pig costume! I vote monkey; but the lamb is a close second! Chris is too funny! I vote monkey. Since your post on how you didn't like monkeys until B was crazy about it, I think its the most appropriate costume and oh sooo adorable! Oh!!!!!! Yoda is what our little two year old Ethan is going as! I LOVE it! Although Yoda may be even cuter when he is walking...he'll be the right height! Yoda is super hilarious, but monkey is so cute! :) Good luck! I like Yoda, but I LOVE, LOVE, LOVE the monkey costume!! I think he would look so cute!! I love the little Monkey! My son was Yoda his first Halloween and he was adorable! But I think B would be a cute monkey too! The monkey is just too cute. But the lamb is a close second! Ive gotta go with the monkey!!! I can see B in the lamb costume! The monkey is cute too and yoda you could do another year after he's walking! Its a bit different but for the price it's something to think about! Oh the Monkey costume is the cutest!! I LOVE the monkey costume....too cute!! Gotta go w/ the monkey - I know you don't like them but they're my favorite! Monkey. Too cute. Chris can be a banana. The monkey gets my vote. I think he would be so cute! Another vote for Monkey!! Supah cute! That monkey costume is just too cute!!!! I vote for that one!! 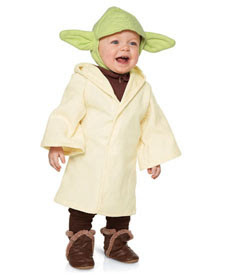 I have seen the Yoda costume before, but I think it would be cuter when he is a bit older! Maybe next year! It has got to be the monkey! No questions asked, he's your little monkey. With that being said, my little Jackson that I watch was Yoda last halloween! The LAMB!!! It is adorable. My BFF's grandson had this one last year, he was a doll. Were you guys at Flying Burrito tonight? I think you were leaving as my family and I were going in....wanted to say hello, but then was afraid it wasn't you! Ha! Our new carseat is an Evenflo 5 pt/booster for the car he rides in the least. I think the name is Chase. It's for 22 pounds and 29 inches & up. Good luck on the search! It's a hard decision. I vote the monkey...just because I think it is so funny that monkey's freak you out, too! Monkey's freak me out so bad, and I had never heard anyone else like this until I read your blog! My friends and family just laugh about it! I do think it is funny that B loves them!! AND this is a cute cuddley monkey and not a freaky monkey...especially because B's face will be the monkey face!! I vote Monkey, but lamb is cute to. BTW I found your blog through Kelly Stamps and B is too cute. Love the monkey. But I love Yoda even more, you can do some pretty cute family costume with the Star Wars theme. But I still say go for the monkey. omg... YODA! That is an absolute trip! I vote for the lamb. I love the monkey, but the lamb is SO precious. You can always do the monkey next year! 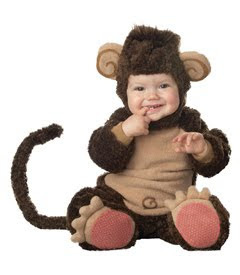 I wanted that very same lamb costume for Kaden, but they didn't have his size, so he's going to be a monkey. I actually found his costume at Walmart believe it or not?!? monkey! I can see his little face in there! Lamb this year, monkey next year, and Yoda the next year is my vote. I love the monkey costume! So cute! Looks like everyone is going w/ monkey! My pick is the lamb. So precious! LOVE the lamb, but my son would never forgive me for picking that over Yoda since he's such a big Star Wars fan. It is adorable too! They are all cute but you should go with the monkey! It's super adorable!